Want precise and defined eyebrows?! 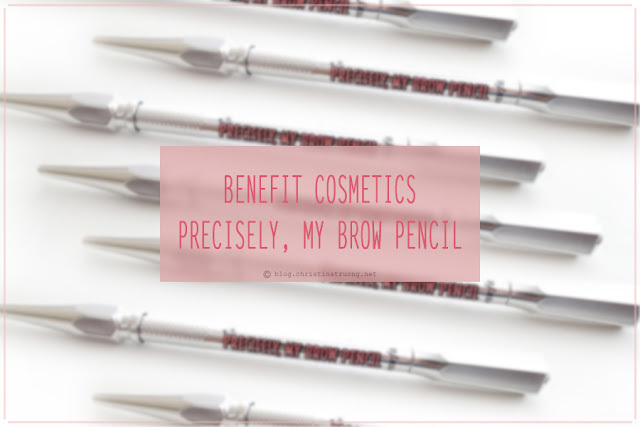 Benefit Cosmetics Precisely, My Brow Pencil is an ultra-fine eyebrow pencil that draws incredibly natural-looking, hair-like strokes that last 12 budge-proof hours. Available in 8 shades, a few strokes of the rich yet blendable colour will transform brows from shapeless and undefined to filled and defined. Hold the brow pencil by the custom control grip. Start at the base of the brow and use tiny hair-like flicks (light, short, upward strokes) to draw in the direction of your natural hair growth. Confession: I was one of those teens who had super thin eyebrows. I didn't even pluck them myself, I went and got them waxed by an esthetician. I was told numerous times by many (mainly my Mom and Aunties) to stop requesting thin eyebrows. Of course I didn't listen - I thought thin brows made me look more "mature" and less of a little girl. Luckily that rebellious phase eventually ended and my brows were able to grow back, for the most part. Although my brows are a bit sparse, I always prefer them being filled in then leaving them bare. Benefit's Precisely, My Brow really help achieve that natural but full brow look without making it seem obvious that they are drawn in. I'm really impressed with the pencil, no sharpener needed. The pencil is twistable so the tip will always be ultra fine, never dull, and continue to create actual hair strokes. The spoolie on the opposite end is helpful for blending the actual brow hairs and the ones drawn on. Overall, great a brow pencil that lasts all day without budging. So if you're someone who is looking for a brow product to fill in your brows and still want to have a natural brow look - Benefit Precisely, My Brow Pencil may be of interest. What are your thoughts on Benefit Cosmetics - Precisely, My Brow Pencil? What type of brow products do you use? Do you prefer natural or bold brows? Do you have a brow story?